My fellow Americans, we are all bit players in the making of a metaphoric slasher movie, “Obama Unchained” starring Barack Hussein Obama. Here is a summary of the movie. It is a heartwarming tale about how the mainstream media and Democratic Party suckered America into electing their extreme far-left dream president; a Trojan Horse in the form of a black man. Once in the Oval Office, Obama began incrementally implementing his socialist/progressive agenda and iron-fist pressure on Americans to conform. Everyone, including a 175 year old order of elderly Catholic nuns were forced to comply to Obama's decreed anti-biblical new moral standards or face termination. Only donors, labor unions and favored friends of his royal Obamaness totaling over 2000 are unlawfully granted exemptions from his tyrannical overreaches hidden in Obamacare. Unchained from pretending to be a moderate to get reelected, Obama is releasing his judgment and rage upon America; wielding his executive pen sword, causing a bloody massacre of our economy, national security, world standing, freedoms, liberty and culture. Pundits say Obama is merely incompetent. They site highly unfavorable approval polling to conclude that Obama's presidency is in deep trouble. Political analysts believe dismal poll numbers will force Obama to back away from his intensely focused savage attack on America as founded; his vowed fundamental transformation of America. These sycophant, apologist or naive talking heads are missing the point. Obama does not give a rat's you know what about polling. Nor does he fear lawsuits, Congress, impeachment or anything else. Remember Michael Jackson's famous line, “I'm not like other guys”? 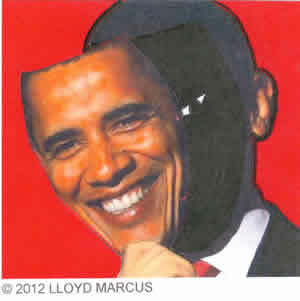 Obama believes he is not like other presidents. I am Barack Obama, the first black president. I can do whatever I please and no one is going to stop me. Period! “Obama Unchained”, the movie, is directed by Unknown Socialists/Progressives. Obama's supporting cast includes Eric (cited in criminal and civil contempt of Congress) Holder as the corrupt partisan head of the DOJ. Lois (Wicked Witch of America) Lerner as the corrupt, vindictive and evil IRS enforcer. Kathleen (Yes, you will fund abortions against your faith) Sebelius as the totally incompetent head of the botched Obamacare roll-out. Jay (please don't make me go out there and lie again with a straight face) Carney as Obama's Press Secretary. This just in, Carney has been replaced by understudy liar, Josh Ernest. If the metaphoric Socialists/Progressive's movie were to snag a Best Song nomination, their song would be titled, “I Believe I Can Lie” performed by Barack Obama. A real trailblazer, Obama is the first U.S. President awarded, “Liar of the Year”. In my metaphoric scenario, the buzz in DC would declare “Obama Unchained” a shoe in for Best Picture. However, the sentimental payback favorite for Best Picture would be “Sixty-Six Years A Liberal” starring Hilary (don't asked me about Benghazi) Clinton. Folks, while I have taken a humorous approach to describing Obama's Revenge War on America, the situation is extremely serious. The solution is quite simple. It is push back, push back, push back politically. While the Tea Party remains fully engaged, what strong courageous conservative will emerge to lead the charge?